Jussie Smollett has been arrested and is in custody of detectives. Chief Communications Officer Anthony Guglielmi announced the news on Thursday, noting the Empire actor had turned himself in. 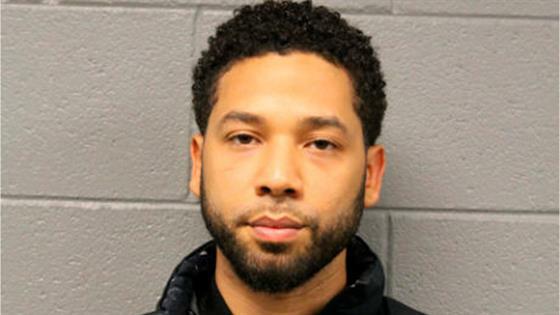 The news came less than 24 hours after Smollett was charged with disorderly conduct for allegedly filing a false police report. In the report, the Jamal Lyon character claimed he had been attacked by offenders yelling racist and homophobic slurs in January. Smollett's attorney released a statement following the Cook County State Attorney's Office approval of the charges. "Like any other citizen, Mr. Smollett enjoys the presumption of innocence, particularly when there has been an investigation like this one where information, both true and false, has been repeatedly leaked. Given these circumstances, we intend to conduct a thorough investigation and to mount an aggressive defense," the statement read. According to Tom Ahern, Deputy Director of News Affairs and Communications for the Chicago Police, Smollett faces a class four felony charge, which is punishable for up to three years in prison. A bond hearing is scheduled for 1:30 p.m. local time. On Jan. 29, Smollett told police he was attacked by two men hurling racial and homophobic slurs while he was out getting food in downtown Chicago. He also claimed the offenders tied a rope around his neck and poured an unknown chemical substance on him, which was later reported to be bleach. Several family members and celebrities expressed their support for Smollett, including his co-stars Terence Howard and Taraji P. Henson. The actor then broke his silence in early February. "Let me start by saying that I'm OK. My body is strong but my soul is stronger. More importantly I want to say thank you. The outpouring of love and support from my village has meant more than I will ever be able to truly put into words," he said in his first statement about the alleged incident. "I am working with authorities and have been 100% factual and consistent on every level. Despite my frustrations and deep concern with certain inaccuracies and misrepresentations that have been spread, I still believe that justice will be served. As my family stated, these types of cowardly attacks are happening to my sisters, brothers and non-gender conforming siblings daily. I am not and should not be looked upon as an isolated incident. We will talk soon and I will address all details of this horrific incident but I need a moment to process. Most importantly, during times of trauma, grief and pain, there is still a responsibility to lead with love. It's all I know. And that can't be kicked out of me." In mid February, police revealed Smollett had turned over some of the phone records requested for the investigation but not all. His rep told NBC Chicago the information in the requested phone records was redacted "to protect the privacy of personal contacts or high-profile individuals not relevant to the attack." Just a few days later, two men were detained and questioned as potential suspects in the case. Police later revealed they had identified persons of interest. Then, ABC7 published a report claiming "multiple sources" had told the news outlet police were investigating whether Smollett and the two men had staged the attack because he was allegedly being written off Empire. However, the Chicago Police Department tweeted that the hoax claims were "unconfirmed." The show also shut down rumors of Smollett being written off. After the two men were questioned, they were released without charges. However, police told E! News the trajectory of the investigation had shifted and requested a follow-up interview with Smollett. While the reasoning behind the shift was not specified, a police source had previously told NBC News the probe had shifted into whether Smollett had paid two men to stage an attack. On Feb. 20, the actor was officially classified as a suspect for allegedly filing a false police report. He was charged with disorderly conduct and filing a false police report on Wednesday. In a press conference on Thursday morning, Feb. 21, Chicago Police Superintendent Eddie Johnson stated, "First, Smollett attempted to gain attention by sending a false letter that relied on racial, homophobic and political language. When that didn't work, Smollett paid $3,500 to stage this attack and drag Chicago's reputation through the mud in the process. And why? This stunt was orchestrated by Smollett because he was dissatisfied with his salary, so he concocted a story about being attacked." On Thursday afternoon, Smollett appeared in a Chicago courtroom where a judge set a $100,000 bond for him. He's also ordered to surrender his passport.